For related races, see 1836 United States elections. Presidential election results map. Blue denotes states won by Van Buren and Johnson or Smith, pale grey-purple denotes those won by Harrison and Granger or Tyler, purple denotes those won by White/Tyler, coral pink denotes those won by Webster/Granger, and bluegrass green denotes those won by Mangum/Tyler. Numbers indicate the number of electoral votes allotted to each state. Incumbent President Andrew Jackson decided to retire after two terms. Jackson publicly endorsed a ticket consisting of Vice President Martin Van Buren of New York and Representative Richard M. Johnson of Kentucky, the latter of whom had gained national notoriety for his role in the War of 1812. Several Southerners opposed Johnson's nomination due to Johnson's relationship with his African-American slave, and the Virginia delegates supported Senator William Cabell Rives against Johnson. Rives's candidacy failed to galvanize support, and Jackson's preferred ticket was nominated at the 1835 Democratic National Convention held in Baltimore, Maryland. The Whig Party emerged during the 1834 mid-term elections as the chief opposition to the Democratic Party. The party was formed from members of the National Republican Party, the Anti-Masonic Party, disaffected Jacksonians, and small remnants of the Federalist Party (people whose last political activity was with them a decade before). Some Southerners who were angered by Jackson's opposition to states' rights, including Sen. John C. Calhoun and the Nullifiers, also temporarily joined the Whig coalition. Unlike the Democrats, the Whigs did not hold a national convention. Instead, state legislatures and state conventions put forward candidates. Southern Nullifiers placed Tennessee Senator Hugh Lawson White into contention for the presidency in 1834 soon after his break with Jackson. 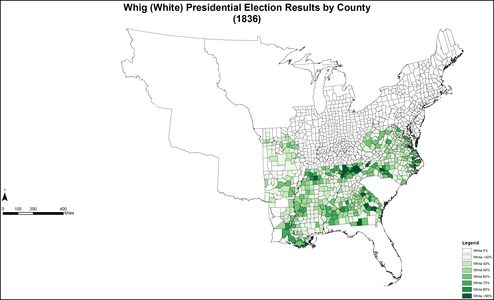 White was a moderate on the states' rights issue, which made him acceptable in the South, but not in the North. The state legislatures of Alabama and Tennessee officially nominated White. The South Carolina state legislature nominated Senator Willie Person Mangum of North Carolina. By early 1835, Whigs in the North were lining up behind Massachusetts Senator Daniel Webster. Both Webster and White used debates in the Senate to establish their positions on the issues of the day, and newspapers nationwide carried the text of their speeches. The Pennsylvania legislature nominated popular former general William Henry Harrison, who had led American forces at the Battle of Tippecanoe. The Whigs hoped that Harrison's reputation as a military hero could win their party votes. 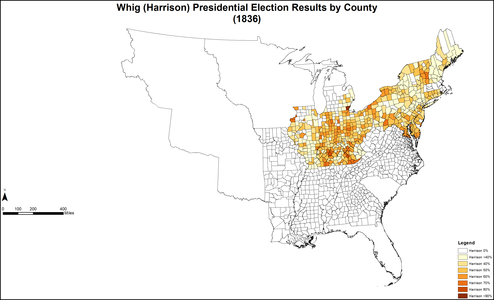 Harrison quickly gained the backing of other Northern Whigs, and by mid 1836, the Northern free states except for Massachusetts and three border states supported Harrison as the Whig candidate. State legislatures, especially in larger states, also nominated various vice presidential candidates. 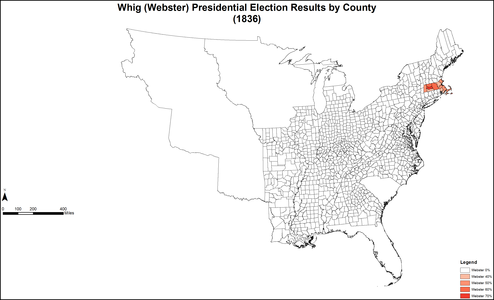 Despite the large number of candidates, there was only one Whig ticket in each state. The Whigs ended up with two primary tickets: William Henry Harrison for president and Francis Granger for vice-president in the North and the border states, and Hugh Lawson White for president and John Tyler for vice-president in the middle and lower South. In Massachusetts, the ticket was Daniel Webster and Granger. In South Carolina, the ticket was Mangum for president and Tyler for vice-president. After the negative views of Freemasonry among a large segment of the public began to wane in the mid 1830s, the Anti-Masonic Party began to disintegrate. Some of its members began moving to the Whig Party, which had a broader issue base than the Anti-Masons. The Whigs were also regarded as a better alternative to the Democrats. A state convention for the Anti-Masonic Party was held in Harrisburg, Pennsylvania from December 14–17, 1835, to choose Presidential Electors for the 1836 election. The convention unanimously nominated William Henry Harrison for President and Francis Granger for Vice President. The Vermont state Anti-Masonic convention followed suit on February 24, 1836. Anti-Masonic leaders were unable to obtain assurance from Harrison that he was not a Mason, so they called a national convention. The second national Anti-Masonic nominating convention was held in Philadelphia on May 4, 1836. The meeting was divisive, but a majority of the delegates officially stated that the party was not sponsoring a national ticket for the presidential election of 1836 and proposed a meeting in 1837 to discuss the future of the party. The Nullifier Party had also begun to decline sharply since the previous election, after it became clear that the doctrine of nullification lacked sufficient support outside of the party's political base of South Carolina to ever make the Nullifiers more than a fringe party nationwide. Many party members began to drift towards the Democratic Party, but there was no question of the party endorsing Van Buren's bid for the presidency, as he and Calhoun were sworn enemies. Seeing little point in running their own ticket, Calhoun pushed the party into backing the White/Tyler ticket, as White had previously sided against Jackson during the Nullification Crisis. Results by county explicitly indicating the percentage of the winning candidate in each county. Shades of blue are for Van Buren (Democratic), shades of orange are for Harrison (Whig), shades of green are for White (Whig), and shades of red are for Webster (Whig). In the aftermath of the Nat Turner slave rebellion and other events, slavery emerged as an increasingly prominent political issue. Calhoun attacked Van Buren, saying that he could not be trusted to protect Southern interests and accusing the sitting Vice President of affiliating with abolitionists. Van Buren defeated Harrison by a margin of 51.4% to 48.6% in the North, and he defeated White by a similar margin of 50.7% to 49.3% in the South. A dispute similar to that of Indiana in 1817 and Missouri in 1821 arose during the counting of the electoral votes. Michigan only became a state on January 26, 1837, and had cast its electoral votes for president before that date. Anticipating a challenge to the results, Congress resolved on February 4, 1837, that during the counting four days later the final tally was read twice, once with Michigan and once without Michigan. The counting proceeded in accordance with the resolution. The dispute had no bearing on the final result: either way Van Buren was elected, and either way no candidate had a majority for vice-president. The Whigs' strategy ultimately failed to prevent Van Buren's election as President, though he earned a somewhat lower share of the popular vote, and fewer electoral votes, than Andrew Jackson had in either of the previous two elections. The key state in this election was ultimately Pennsylvania, which Van Buren won from Harrison with a narrow majority of just 4,000 votes. Had Harrison been able to win the state, Van Buren would have been left eight votes short of an Electoral College majority, meaning that the Whig goal to force the election into the House of Representatives would have succeeded, and the House would have been forced to choose between Van Buren, Harrison, and White, as the three candidates with the most electoral votes. Given that the Democrats still held a majority in the House, however, Van Buren would likely still have been victorious. Virginia's 23 electors were all pledged to Van Buren and his running mate, Richard Mentor Johnson. However, all 23 of them became faithless electors due to dissension related to his interracial relationship with a slave and refused to vote for Johnson, instead casting their votes for former South Carolina senator William Smith. This left Johnson one electoral vote short of the 148-vote majority required to be elected. Thus, in accordance with the Twelfth Amendment to the United States Constitution, the Senate decided between the top two vote recipients, and chose Johnson over Francis Granger. This was the last election in which the Democrats won Connecticut, Rhode Island, and North Carolina until 1852. This was also the only election where South Carolina voted for the Whigs and the last time it voted against the Democrats until 1868. Source (Popular Vote): Leip, David. 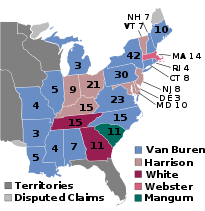 "1836 Presidential Election Results". Dave Leip's Atlas of U.S. Presidential Elections. Retrieved July 27, 2005. Source (Electoral Vote): "Electoral College Box Scores 1789–1996". National Archives and Records Administration. Retrieved July 31, 2005. (b) Mangum received his electoral votes from South Carolina where the Electors were chosen by the state legislatures rather than by popular vote. Source: "Electoral College Box Scores 1789–1996". National Archives and Records Administration. Retrieved July 31, 2005. Source: Data from Walter Dean Burnham, Presidential ballots, 1836-1892 (Johns Hopkins University Press, 1955) pp 247–57. Since no candidate received a majority of the electoral votes, the vice-presidential election was thrown into a contingent election in the U.S. Senate. Following the provisions of the Twelfth Amendment, the Senate was required to choose between Richard Johnson and Francis Granger as the next vice president. On February 8, 1837, Johnson was elected easily on the first ballot by a vote of 33 to 16. ^ "Voter Turnout in Presidential Elections". The American Presidency Project. UC Santa Barbara. Archived from the original on January 12, 2017. ^ Cole, Donald B. (1984). Martin Van Buren and the American Political System. Princeton, NJ: Princeton University Press. p. 279. ISBN 0-691-04715-4. Retrieved March 23, 2017. ^ a b c d e Deskins, Donald Richard; Walton, Hanes; Puckett, Sherman (2010). Presidential Elections, 1789-2008: County, State, and National Mapping of Election Data. University of Michigan Press. pp. 106–107. ^ United States Congress (1837). Senate Journal. 24th Congress, 2nd Session, February 4. pp. 203–204. Archived from the original on April 4, 2015. Retrieved August 20, 2006. ^ "A Century of Lawmaking for a New Nation: U.S. Congressional Documents and Debates, 1774 - 1875". memory.loc.gov. Archived from the original on April 9, 2018. "U.S. President - Whig Nominees 1836". OurCampaigns.com. Retrieved March 20, 2008. 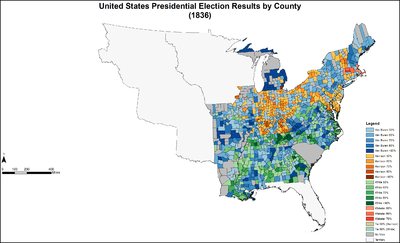 Wikimedia Commons has media related to 1836 United States presidential election.